Truman Alumna Presents Undergraduate Research in Washington, D.C.
Marie Orton, associate professor of Italian, (right) receives the Educator of the Year award from Becky Hadley (left) at the banquet May 2. 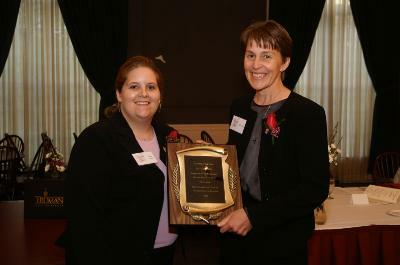 Marie Orton, associate professor of Italian, was announced as the 2006 Educator of the Year at the 17th annual banquet May 2. Orton began her career at Truman in 2000. She received her bachelor’s degree from Brigham Young University and both her master’s and doctorate degrees from the University of Chicago. Orton previously taught at Duke University and has taught at the Joseph Baldwin Academy every summer since 2001. Having earned a Fullbright Research Fellowship, her primary areas of research are contemporary Italy and Italian cultural studies, autobiography, holocaust literature and immigration literature. Orton is also a member of Phi Kappa Phi and the adviser to the Italian Club (CIAO). This year 102 students nominated a record-breaking 66 faculty members for the Educator of the Year award. The eight-member student committee first narrowed the group down to 12 semi-finalists and then to six finalists. Finally, after reviewing the written responses by the nominated faculty members, getting input from the students in their classes and observing the faculty members in their classrooms, the committee selected this year’s honoree. Students from Student Senate, the Pershing Society and Phi Kappa Phi serve on the Educator of the Year committee. Gov. Matt Blunt (left) and University President Barbara Dixon (right) congratulate Lynn Rose (center) on receiving the Governor’s Award for Excellence in Teaching. 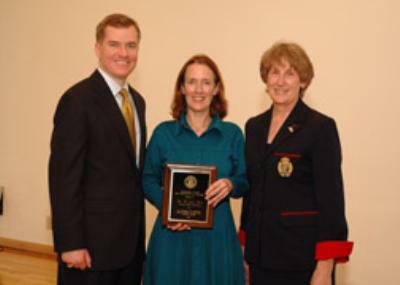 Lynn Rose, associate professor of history, received special recognition from Gov. Matt Blunt during the luncheon at the 2006 Governor’s Conference on Higher Education recently in Columbia, Mo. Rose was one of 14 outstanding faculty members, each representing a Missouri college or university, to be recognized for her commitment to excellent education for Missouri citizens. Rose was chosen for her effective teaching, innovative course design and delivery, effective advising, service to the institutional community, commitment to high standards of excellence and success in nurturing student achievement. Rose began her career at Truman in 1995. She received both her doctorate and bachelor’s degree from the University of Minnesota-Minneapolis. 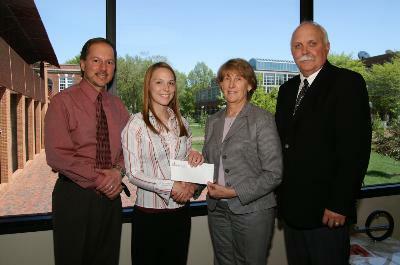 She also received Truman’s Educator of the Year Award in the spring of 2005. Truman faculty and students presented at the Missouri Speech Language Hearing Association (MSHA) Convention that took place March 31-April 2. Several students presented poster sessions at the MSHA 2006 convention. Paula Cochran, professor of communication disorders, was the faculty mentor for all of the student presentations. Faculty members also presented at the MSHA 2006 convention. Gooch also presented “Minimal, Maximal and Multiple Oppositions - How to Decide?”. The Truman faculty also sponsored the second annual TruBash, a gathering for Truman alumni and friends, on the evening of March 31 at the MSHA convention. 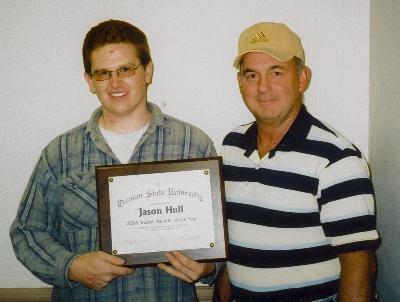 Jason Hull (left) receives the 2006 Student Recycler of the Year award from Howard Worcester, Truman’s recycle coordinator, (right) on May 5. Jason Hull, a senior justice systems major from Fulton, Mo., was awarded the 2006 Student Recycler of the Year Award at a ceremony on May 5. Howard Worcester, Truman’s recycle coordinator, presented Hull with the award. Hull has worked at the Recycling Center for the past three years making a significant contribution to the University’s recycling efforts. The Student Recycler of the Year Award is presented for hard work, dedication and devotion to the recycling program. The students who were inducted include (front row, left to right) Kelli Mullarkey, Pam Corder, Avril Frick, Shino Saito, Rachael King, Carol Carlson and Michelle Jones; (back row, left to right) Jennifer Hinkle, Matt Safley, Shelly Layton, Annette Nick, Michael Van Bebber and Ashley King. Jared Brockmeyer and Christopher Gillette are not pictured. University President Barbara Dixon (front row, far right) was also in attendance. Pi Kappa Lambda, the national music honor society, inducted 15 students into its membership this spring. Michael Bump, associate professor of music, (left) Truman State University President Barbara Dixon (second from right) and Bob Jones, dean of the fine arts division and professor of art, (right) present Megan Arns (second from left) a check for $4,000 from the Presser Foundation. Megan Arns, a junior music and pre-accounting double major from St. Charles, Mo., has been named a Presser Scholar for the 2006-2007 academic year. The Presser Scholarship is given to an outstanding music major at the end of his or her junior year. 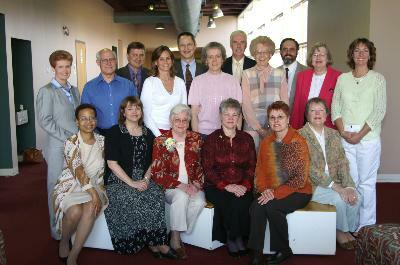 The foundation’s grant of $4,000 was awarded to Arns at the spring Fine Arts award ceremony in April. Theodore Presser is remembered not only as the publisher of “Etude,” the music magazine, and the founder of the great music publishing firm bearing his name, but as a philanthropist who specialized in music education. Arns is involved in Sigma Alpha Iota, Alpha Kappa Psi, Percussion Ensemble, Drumline, Wind Symphony and the Truman Percussion Society. People at the Nursing Advisory Council meeting include (front row, left to right) Bertha Thomas, Brenda Higgins, Myra Baiotto, Elsie Gaber, Delores Lesseig and Harriett Beard; (second row, left to right) Shirley Riley, Charles Baldwin, Melanie Grgurich, Judi Misale, Alvina Britz, Odessa Ofstad and Alice Allinson; (third row, left to right) Mark Gambaiana, Tim Tucker, Mark Laughlin and Dennis Smith. Martha Gragg, Jack and Sue Magruder, Lesa McCartney, James and Rene McGovern, Peg Ernst, Jill McCord, Toni Smith, Jerry Smith, Renee Brayton, Bonnie Collier, Stephanie Keith and Carol Race are not pictured. The Truman State University Nursing Program Advisory Council met on April 6. The Council’s purpose is to promote the recognition, welfare and progress of nursing education at Truman through advising and consulting with the Nursing Program. Truman alumna Stephanie Lê (’05) and her faculty mentor, Steven D. Reschly, associate professor of history, traveled to Washington, D.C., where Lê presented her research about Vietnamese immigration on April 25. 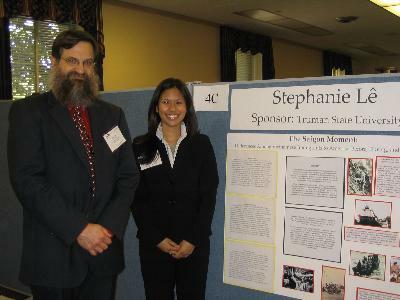 Stephanie Lê, a December 2005 Truman alumna who graduated with a bachelor of arts in history, presented her research on Vietnamese migration to the United States at the Council on Undergraduate Research “Posters on the Hill” event April 25, in Washington, D.C. Her faculty mentor for the project, Steven D. Reschly, associate professor of history, accompanied her for the presentation in the Rayburn House Office Building on Capitol Hill. Lê’s proposal was one of 60 chosen from more than 300 submissions. The project, titled “The Saigon Moment: Differences among Vietnamese Immigrants to America, Before, During, and After 1975,” was supported by a Truman summer research grant. She interviewed 24 Vietnamese immigrants and Vietnamese-Americans, seven who left Vietnam before 1975, 12 who left during and immediately after April 1975, when Saigon fell to North Vietnamese forces, and five who left the reunified Communist Vietnam. She demonstrated that the timing of emigration from South Vietnam was a decisive factor in shaping the cultures of Vietnamese immigrants in the United States. Lê completed the project for the HIST 400 - Senior Seminar in History course taught by Marc Becker, associate professor of history. As part of the program, Lê and Reschly met with Sen. Jim Talent and spoke with staffers in the congressional offices of Sen. Kit Bond, Sen. Tom Harkin, Sen. Barack Obama, Rep. Emanuel Cleaver II and Rep. Kenny Hulshof to promote undergraduate research and support for higher education. Lê now works for the White House Initiative on Asian Americans and Pacific Islanders. The Community Sharing Bike Program (CSBP) is looking for bike donations, especially from people leaving campus and leaving a bike behind. People who have a bike in virtually any condition may drop it off at the Truman State University Recycling Center, across from the tennis courts on La Harpe. The Recycling Center is open from 8 a.m.-3 p.m., Monday-Friday. People may also do an after hours drop off on the recycling pad, but this option is not secure. CSBP will postpone services during the summer, due to a lack of “renting” infrastructure. The program will begin again with the start of the fall 2006 semester. The first Maintenance Mayhem workshop on bike repairs will take place during the fall semester. Experienced mechanics will work side by side with novices at this event to fix up and tune up the bikes and teach/learn about bike care. Students who are staying in Kirksville during the summer and would like to have a bike to meet their transportation needs can contact Cassie Phillips to establish eligibility for an extended summer loan. Participants must register in the program and commit to good bike stewardship by locking the bike up when not in use, resolving minor maintenance issues like repairing flat tires, and preferably keeping the bike protected from rain. CSBP was started in December 2005 and introduced a fleet of 15 bikes to the Truman community in March 2006. The program is designed to give students and community members easy access to healthy, environmentally friendly and inexpensive transportation. Although the main coordinators of the program are the Environmental Campus Organization (ECO) and the Mountain Biking Club, the strength of the program lies in its dependence on the generosity and support of many organizations and individuals through donations of time, money, bikes, tools and labor. Through the Community Sharing Bike Program, registered participants can borrow a bike any time the residence hall desks are open. The coordinators hope that the program will grow, inspiring people to look for alternatives to automotive transport. To register for the Community Sharing Bike Program (CSBP), fill out an official registration form at a CSBP event or any residence hall desk. Make sure you fill out the entire form, including all contact information, and read and sign the waiver at the bottom. Also, fill out an official bike card, including all contact information, and sign the back. On the space for “file binder” write the name of the residence hall in which you are registering. This allows the program coordinators to track the paperwork. However, you may borrow a bike from any dorm. Finally, a worker will confirm your identity and student ID number with your student ID or your license number with your driver’s license and file your form. For more information, contact one of the program coordinators: Cassie Phillips at 660.888.1202 or cassiephillips@care2.com; Michelle Brown at 785.5755 or mlb105@truman.edu; or Michael Herron at 785.5777 or msh907@truman.edu. 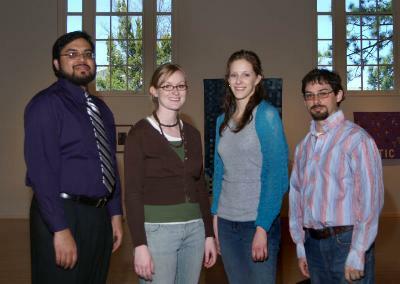 Sujit Chemburkar, director of the Student Union Building, (left) and Aaron Fine, director of the University Art Gallery (right) gather with award winners Megan Irwin (second from left) and Keila Ferree (second from right). Additional winner Mackenzie Smith is not pictured. The Student Union purchase prize winners from the Annual Juried Student Art Show are Keila Ferree, a junior art major from Nevada, Mo. ; Megan Irwin, a senior art major from Columbia, Mo. ; and Mackenzie Smith, a senior art major from Lone Jack, Mo. Ferree was the first place award winner for her mixed media piece, “Untitled.” She received $300. The other two winners each received $100 as second place winners. All pieces will become part of the Student Union’s permanent collection of student art. The John Gyles Education Awards are available each year to students in both Canada and the United States. They are the result of a private, benevolent endeavor established in 1990. Full Canadian or American citizenship is a requirement. Awards are available to both male and female students for all areas of post-secondary study. A minimum GPA of 2.7 is required. Criteria other than strictly academic ability and financial need are considered in the selection process. Selected students will receive up to $3,000. The filing date for mailing applications is June 1. Applications are available online at http://www.johngyleseducationcenter.com. The Missouri Department of Natural Resources is offering an Environmental Education Scholarship Program (EESP) designed to provide scholarships to minority and other underrepresented students pursuing a bachelor’s or master’s degree in an environmental course of study. Applicant must be a current Missouri resident, graduate of an accredited high school, have a cumulative high school GPA of 3.0 on a 4.0 scale or if enrolled in college, having a cumulative GPA of 2.5 on a 4.0 scale, and enrolled as a full-time student in a Missouri post-secondary institution. Qualified candidates must be pursuing a degree in one of the following areas of study: civil, chemical, mechanical, agricultural engineering or environmental engineering; environmental areas such as geology, biology, wildlife management, planning, some aspect of natural resource management or a closely related field; environmental chemistry, or environmental law enforcement. Applications are available in the Truman State University Financial Aid Office. Application deadline is July 1. Howard Elsberry, president and CEO of Westlake Hardware, Inc., will deliver the commencement address. There will be a reception immediately following commencement at Red Barn Park. In the case of inclement weather, the ceremony will take place in Pershing Arena and the reception will be in the Student Union Building Activities Room. The menu will include free hamburgers, hotdogs, veggie burgers, barbequed chicken, bratwursts, chips, soda and dessert. May graduates will receive a free alumni gift bag full of alumni gear – T-shirt and more. Those who cannot attend lunch, may stop by the Office of Advancement, McClain Hall 101, to pick up their free alumni gift bag. For more information contact Denise Smith, manager of alumni relations, dlsmith@truman.edu or Greg Xander, alumni relations assistant, gregx@truman.edu, 785.4133 or 800.452.6678. Contact Graeme Allen at 660.349.0851 for more information. For more information, contact Crista Chappell at 785.4109 or gradinfo@truman.edu. Baker will present a series of historic documents that illuminate moments in history and illustrate the kinds of problems encountered by conservators. This lecture is open to members of the Truman community and the general public. Sponsored by Pickler Memorial Library. For more information, contact Wanda Cagle at 785.4038. The 2006 Homecoming committee is looking for faculty, staff and administration volunteers to judge the events to take place Oct. 16-21. Judges will be needed for every day with the exception of Wednesday. For more information or to volunteer, contact Logan Johnson, the points and awards co-chair for the 2006 Homecoming festivities, at 665.9622 or ldj858@truman.edu. If you have planned an on-campus event for the upcoming academic year, do not forget to submit it to the Master Calendar at http://www.truman.edu/pages/203.asp. The Truman State University Public Relations Office is now accepting résumés for the fall 2006 internship position. Interested students should stop by the Public Relations Office, McClain Hall 100, call 785.4016 or e-mail Katie Best at kbest@truman.edu, before May 11. Students can now register for BIO 444 - Expanding Environmental Consciousness for the fall 2006 semester. Taught by Michael Kelrick, professor of biology. This will be a student-led discussion course allowing students to explore their relationships to the world around them. For more information, contact Kelrick at mkelrick@truman.edu or 785.4071. Joe Benevento, professor of English, has been informed that his novel, “The Odd Squad,” has been declared a finalist for the Binghamton University John Gardner Fiction Book Award. Marijke Breuning, associate professor of political science, has been accepted to the United States Institute of Peace 2006 Faculty Seminar “Global Peace and Security from Multiple Perspectives.” This seminar will focus on the new international security environment, approaches to managing conflict and new ways of teaching global peace and security. It will take place at the U.S. Institute of Peace in Washington, D.C.
John Ishiyama, professor of political science, was the editor of a special issue of the journal Party Politics that appeared in May 2006. The special issue was on the political performance of formerly dominant parties in authoritarian regimes. The article titled “African Phoenix? Explaining the Electoral Performance of the Formerly Dominant Parties in Africa,” co-authored by Ishiyama and John Quinn, associate professor of political science, also appeared in that special issue. In addition, Ishiyama was recently invited to present a paper titled “Learning to Lose (and Sometimes Win): The Neocommunist Parties in Post Soviet Politics” at a special conference titled “Learning to Lose: Adapting to Democracy in One-Party Dominant Systems” March 31-April 1, at the University of Toronto. The next issue of the Truman Today will be published June 6. The Truman Today is published biweekly during the summer. Submissions for this issue are due by May 31 to kbest@truman.edu. Sodexho is sponsoring the Generous Helpings Hunger Relief Initiative now through May 12. Sodexho is assisting in raising additional funds by purchasing specified manufacturer food and supply products. One hundred percent of the additional funding earned will be distributed to the Sodexho Foundation to support hunger programs. Every day, Sodexho will Show Case a particular item that will use these featured products from a participating manufacturer. Using more of these products will increase the amount of money donated to hunger relief in North America. This year’s annual boiler shutdown for maintenance and inspection is scheduled for May 16-26. The campus will be without steam for building heat and hot water throughout the shutdown period. It is anticipated that the boilers will be back on-line by the afternoon of May 26. If you have any questions regarding the shutdown, or if you have schedule conflicts to address, please notify the Physical Plant Office as soon as possible as 785.4200. The Center for Teaching and Learning will sponsor a “Publish, Don’t Perish Workshop” from 1:30-4 p.m., May 19, in PML 205. Faculty and staff are invited to try this no-nonsense method of academic writing. For more information, contact Linda Davenport at 785.4391 or ctl@truman.edu. The Center for Teaching and Learning will sponsor a Sabbatical Proposal Workshop from 10 a.m.-2 p.m., May 23, in PML 205. Faculty and staff members are invited to take advantage of this opportunity to jumpstart their proposal writing before the Sept. 8 deadline when all the beginning of the semester activity will be distracting. For more information, contact Linda Davenport at 785.4391 or ctl@truman.edu. The exhibit “Normal to Truman: A 10th Anniversary Celebration of Our Name Change” is currently on display in the Pickler Memorial Library gallery. The exhibit will be on display until July 1. It covers all the name changes in Truman’s history and a few of the events of note that occurred under each name, including the transition from a private to a state school, the mission change, the Mitau Award, the “firsts” (first Index, first yearbook), and more. For more information, contact Elaine M. Doak at 785.7368.